As two highly-talented quarterbacks anticipate being selected at the top of the 2016 draft, the quarterback selected No. 1 overall in the 2007 draft is petitioning teams for a second chance. 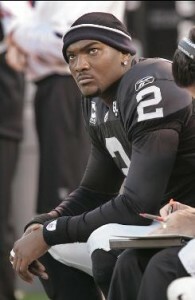 Former Raiders signal caller JaMarcus Russell tells SI.com (video link) that he has penned a letter to all 32 teams looking for a shot. Russell wowed scouts in workouts with his arm strength and his big 6’6″ frame led many to believe that he was destined for greatness at the next level. However, the LSU product did not deliver in the NFL. From 2007-2009, Russell started 25 games for the Raiders and in the following offseason, Oakland cut him loose. In his short time in the pros, Russell developed a reputation as a player with a weak worth ethic and a penchant for fluctuating on the scales. In the last six years, no team has showed real interest in signing the former No. 1 pick. It would be surprising if Russell were to land an opportunity today, but that won’t stop him from trying. With just two quarterbacks currently under contract, the Minnesota Vikings most likely will come away from the 2014 NFL Draft with at least one new signal caller. Matt Cassel recently signed a two-year deal with the club, and Christian Ponder is under club control for at least one more season, but neither are franchise quarterbacks. In separate pieces for the Minneapolis Star Tribune, Matt Vensel and Mark Craig break down the potential fits of the consensus top-three throwers: Texas A&M’s Johnny Manziel, Central Florida’s Blake Bortles and Louisville’s Teddy Bridgewater. Vensel separates his thorough profile of Manziel into sections, analyzing Johnny Football’s dazzling play-making ability, his smallish stature, the rock star persona and other potential choices at the position Minnesota may make. Thanks to Michael Vick and other mobile quarterbacks who have had success in the league, Vensel contends that general manager Rick Spielman will have to reconsider the future of the position, which in the past has relied upon the tall, statuesque passers. Craig looks in depth at Bortles and Bridgewater, speaking to David Gibbs, the University of Houston defensive coordinator who faced the two quarterbacks in consecutive weeks last season. Gibbs likes Bortles upside, but said he’s more prone to force a throw, whereas Bridgewater is content to check down on third-and-20 rather then turn the ball over.